I loved this book! Waves of Mercy is so well-written. It’s one of my new favorite books. I love historical fiction, but the story is so relatable to every era. Do you ever question God? Have you ever been so angry with Him that you’ve isolated yourself from His love and fellow Christians? Been there, done that. I’m sure that we all have had things happen in our lives where we just cannot see how God could allow it to happen to us. Maybe you’ve lost a child, a parent, a spouse. Perhaps you’ve been through a huge financial loss or struggle. Where is God in all of this? He’s still there even when we feel like He has abandoned us. Even when we have faced crises beyond what we’ve felt we could handle, He is with us. Gessje has felt these losses. When she is asked to write her memoirs, Gessje isn’t sure how much of the “truth” she should add. Should she share how she raged against God and turned her back on her faith, or should she just write trite accounts of how her family left the Netherlands to find religious freedom in America? She chooses to write it all, allowing her young neighbor Derk to read her story as it progresses. I wish I could share everything I felt while reading this book, but you have to read it yourself and experience those feelings. While I was reading, I could relate so much to Gessje, and I felt relief that the author must have felt this way too. Even though you know you aren’t the only one who has been mad at God or felt like your life hasn’t turned out the way you wanted it to, it is a relief to have validation. I’m sure you know what I mean! The way that this book ends is so good, but I hope that the author writes another with these same characters! I love them. They are so real. Their flaws make them relatable. And their hearts make you love them. 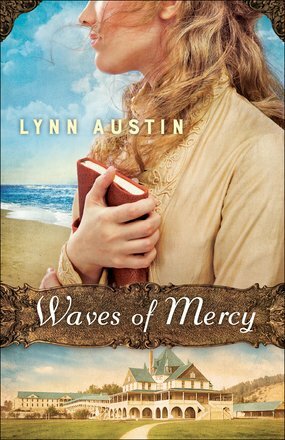 I highly recommend Waves of Mercy. I enjoy historical fiction books as well and you make me want to read this one for myself. Thanks for sharing.